Ladies finger, familiarly known as bhendi is a very nutritional vegetable rich with several rich antioxidants and is very rich in in fibre. It is also generally believed that people with visual problems should consume this vegetable for a better eye sight. Many types of dishes can be prepared using this vegetable.The one that I am going to show is purely a South Indian dish which goes on well with rice. 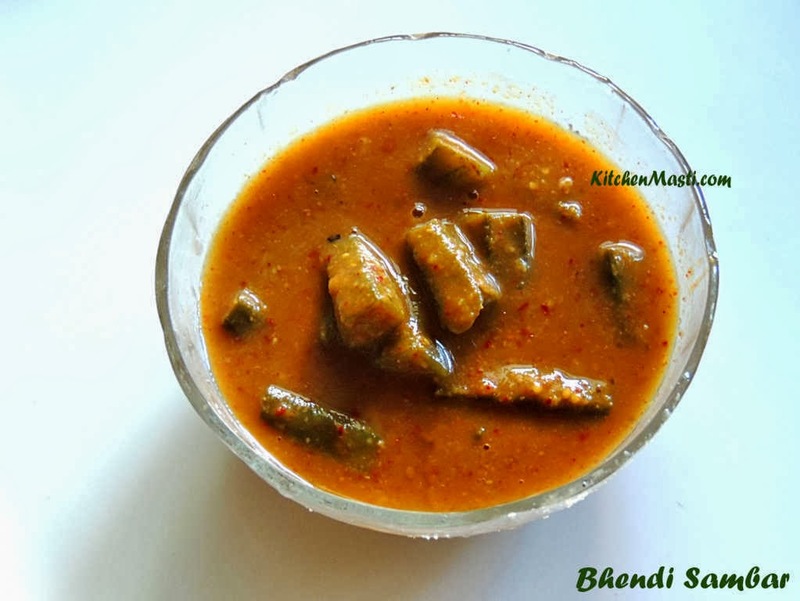 How To Prepare Ladies Finger / Okra Sambar. This is also popularly known as bendi sambar. In Kannada, it is known as Bendekayi Huli. The time taken to prepare it is around 30 minutes. Tuar dal ( pigeon peas ) - 1/2 cup. Tamarind - small goose berry sized ball. Red chilli ( byadige ) - 6. Coriander seeds ( dhania ) - 3 tsp. Bengal gram dal - 1 tbsp. Black gram deal ( urad dal ) - 1/2 tsp. Cumin seeds ( jeera ) - 2 tsp. Fenugreek seeds ( methi ) - 1/2 tsp. Method To Make Okra Sambar. First and foremost, you have to wash the dal and pressure cook it . Wash and wipe the ladies finger so that there is no moisture content left. Chop the vegetable into around 1 inch sized pieces and transfer them in to a vessel. Prepare the tamarind juice by soaking the tamarind in 1/4 cup of water and later gently squeeze it. Add this tamarind juice to the chopped vegetable and stir it well. Keep it aside for around 5 minutes. Now add 2 cups of water and allow it to boil on a medium heat. Add salt, turmeric powder and green chilli in it. Meanwhile let us prepare sambar powder. For this you will have to heat a small pan with 2 tsp of oil in it. Add red chilli and fry for around a minute. Later on add the Bengal gram dal and urad dal and fry for a few seconds. Now mix in coriander seeds, jeera seeds, fenugreek seeds, coconut scrapings and fry it. Switch off the flame and then add washed curry leaves and asafoetida. Keep it aside to cool for some time. Transfer it to a mixer jar and ( dry ) powder it to a fine consistency. When the vegetables are done, add this sambar powder and boiled tuar dal. Mix in the jaggery and chopped coriander leaves. Finally mix in the asafoetida and switch off the flame. Prepare a tadka ( seasoning ) by heating a small pan with coconut oil in it. Add 1 broken red chilli, urad dal ( black gram dal ), mustard seeds and curry leaves into it. When it start to splutter, transfer it to the sambar vessel. Your traditional and tasty bendi sambar is ready to be served along with rice.!!! Adding tamarind juice is very essential, other wise the sambar will turn sticky due to the vegetable. There is no such rule that you have to use only coconut oil. Any type of oil can be used for that matter.